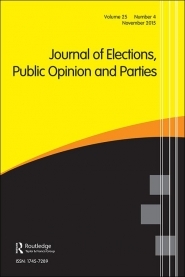 A new paper by Philippe Mongrain is now available online at the Journal of Elections, Public Opinion and Parties. A summary of this article will soon be available on the blog of the Elections, Public Opinion and Parties (EPOP) Group of the Political Studies Associations (PSA). The research note is available here. This content has been updated on 4 February 2019 at 9 h 37 min.